Explore the Natural Wonders around Tamarindo on an ATV! 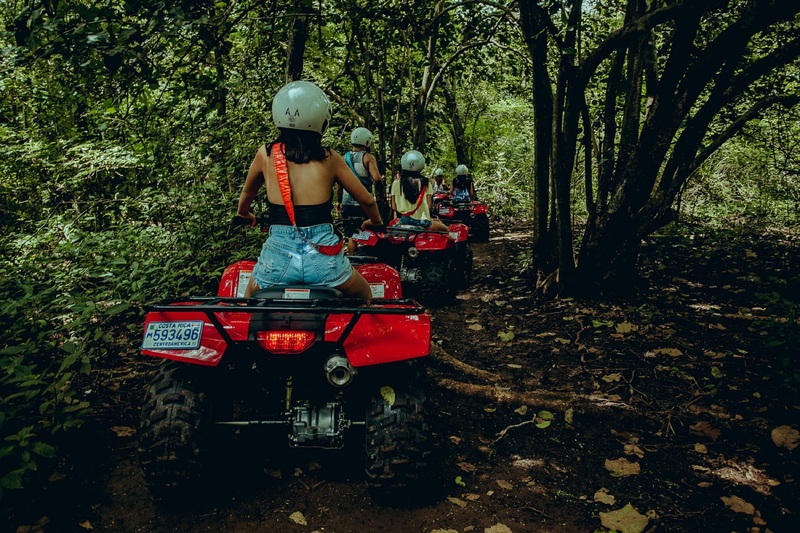 A perfect tour for both beginners and experienced drivers, riding an ATV ride off-road gives you the ultimate opportunity to see the forest surrounding Tamarindo, as well as the chnace to see native wildlife such as monkeys, iguanas, and many birds. You will also see incredible views of the coastline including secluded, pristine beaches. Tamarindo is renouwned for it’s dramatic picturesque sunsets, and with this1 hour ATV Sunset Tour you will get to see it like you never imagined. Take a 30 minute ride up to the highest point in Tamarindo, also known as the ‘Mirador’ where you will have a near 360 degree view of the surrounding mountains and bays. Bring your camera or GoPro for this one! Upon arriving at the the office for your Tamarindo ATV Mountain tour, you will be given helmet and goggles and a 15 minute instruction lesson on how to operate the Honda semi-automatic ATVS. If you haven’t ever driven an ATV before, don’t worry! They are very easy and the crew will make sure you are comfortable driving before setting off on the tour. After everyone has been though the safety and operational orientation, everyone will begin driving off into the mountains surrounding Tamarindo. Must be 16 years old with a valid drivers license to drive the ATVs, otherwise, you must ride as a passenger on the back of a driver. Upon arriving at the the office for your Tamarindo ATV Snorkeling tour, you will be given helmet and a 15 minute instruction lesson on how to operate the Honda semi-automatic ATVS. If you haven’t ever driven an ATV before, don’t worry! They are very easy and the crew will make sure you are comfortable driving before setting off on the tour. After everyone has been though the safety and operational orientation, everyone will begin driving off into the forest surrounding Tamarindo, heading to the first beach. Be prepared to get dirty! You will drive through the beautiful tropical forest surrounding Tamarindo where you will most likely see monkeys, iguanas and birds hanging out in the trees! After riding through the back trails with stunning views of Tamarindo Bay, you will continue to drive off road trails to Playa Conchal. Here you will park your ATVs right on the beach and put on your snorkel gear. If you have never snorkeled before, the guide will help you put on the gear and show you how to use it. It’s easy! You will swim along the reef in pristine crystal blue waters of Playa Conchal viewing a variety of tropical fish, with the opportunity to see eels, octopus, and more! After about 30-45 minutes of snorkeling, you will get back on your ATV and drive through more back trails to Tamarindo. Upon arriving at the the office for your Tamarindo ATV Beach tour, you will be given helmet and goggles and a 15 minute instruction lesson on how to operate the Honda semi-automatic ATVS. If you haven’t ever driven an ATV before, don’t worry! They are very easy and the crew will make sure you are comfortable driving before setting off on the tour. After everyone has been though the safety and operational orientation, everyone will begin driving off into the forest surrounding Tamarindo, heading to the first beach. Pick up times may vary due to tides, pick up location, and sunset times. Please contact us to verify your pick up time. Single: $45 Double (Driver & Passenger): $65 Tamarindo is renouwned for it's dramatic picturesque sunsets, and with this1 hour ATV Sunset Tour you will get to see it like you never imagined. Take a 30 minute ride up to the highest point in Tamarindo, also known as the 'Mirador' where you will have a near 360 degree view of the surrounding mountains and bays. Bring your camera or GoPro for this one! Single: $75 Double (Driver & Passenger): $105 Upon arriving at the the office for your Tamarindo ATV Mountain tour, you will be given helmet and goggles and a 15 minute instruction lesson on how to operate the Honda semi-automatic ATVS. If you haven’t ever driven an ATV before, don’t worry! They are very easy and the crew will make sure you are comfortable driving before setting off on the tour. After everyone has been though the safety and operational orientation, everyone will begin driving off into the mountains surrounding Tamarindo. You will drive through the beautiful tropical forest in the mountains surrounding Tamarindo where you will most likely see monkeys, iguanas, and more hanging out in the trees! You will start off driving on dirt roads up to the mountains and then continue down off road trails. Be prepared to get dirty! You will also get to lookout points along the way with stunning views of the Tamarindo Bay. Must be 16 years old with a valid drivers license to drive the ATVs, otherwise, you must ride as a passenger on the back of a driver. Single: $99 Double (Driver & Passenger): $139 Upon arriving at the the office for your Tamarindo ATV Snorkeling tour, you will be given helmet and a 15 minute instruction lesson on how to operate the Honda semi-automatic ATVS. If you haven’t ever driven an ATV before, don’t worry! They are very easy and the crew will make sure you are comfortable driving before setting off on the tour. After everyone has been though the safety and operational orientation, everyone will begin driving off into the forest surrounding Tamarindo, heading to the first beach. Be prepared to get dirty! You will drive through the beautiful tropical forest surrounding Tamarindo where you will most likely see monkeys, iguanas and birds hanging out in the trees! After riding through the back trails with stunning views of Tamarindo Bay, you will continue to drive off road trails to Playa Conchal. Here you will park your ATVs right on the beach and put on your snorkel gear. If you have never snorkeled before, the guide will help you put on the gear and show you how to use it. It's easy! You will swim along the reef in pristine crystal blue waters of Playa Conchal viewing a variety of tropical fish, with the opportunity to see eels, octopus, and more! After about 30-45 minutes of snorkeling, you will get back on your ATV and drive through more back trails to Tamarindo. Must be 16 years old with a valid drivers license to drive the ATVs, otherwise, you must ride as a passenger on the back of a driver. Single: $120 Double (Driver & Passenger): $160 Upon arriving at the the office for your Tamarindo ATV Secluded Beach tour, you will be given helmet and goggles and a 15 minute instruction lesson on how to operate the Honda semi-automatic ATVS. If you haven’t ever driven an ATV before, don’t worry! They are very easy and the crew will make sure you are comfortable driving before setting off on the tour. After everyone has been though the safety and operational orientation, everyone will begin driving off into the forest surrounding Tamarindo, heading to the first beach. Be prepared to get dirty! You will drive through the beautiful tropical forest surrounding Tamarindo where you will most likely see monkeys, iguanas, and more hanging out in the trees! After riding through the back trails with stunning views of Tamarindo Bay, you will continue to drive off road trails to Playa Conchal. Here you can swim in the crystal blue waters, relax on the beach, and view monkeys nearby. Then we will head to Playa Minas, and after to Playa Pirata. These last two beaches are hidden gems off the beaten path in Guanacaste that few get to see while they are here. After the last beach, we will head back to Tamarindo. Don’t wear anything white! It will never be white again! Must be 16 years old with a valid drivers license to drive the ATVs, otherwise, you must ride as a passenger on the back of a driver.